The final stages of a big project are satisfyingly boring. There is not much thinking left to do. Any opportunity for brilliance has expired. Your job now is to spot typos, double-check bibliographical details, scrutinize fonts, and look out for embarrassing factual errors. Occasionally, there is also an index to compile. Indexes are incredibly tedious — especially if you’re forced to do your index in Word. Microsoft clearly stopped assigning their talented programmers to work on indexing features around 1988. It’s a nasty, cumbersome, sloppy, dull process. The only fun comes when you’ve done all the grunt work and you get to examine the index itself. After being very close to your project for many years, it gives you a chance to see your work from a distance — to see what you’ve been up to for all this time. I have three pretty different Shaws: George Bernard Shaw, of course, along with actor Fiona Shaw (famous for her appearance on Faber’s Waste Land iPad app) and graphic novelist Dash Shaw. 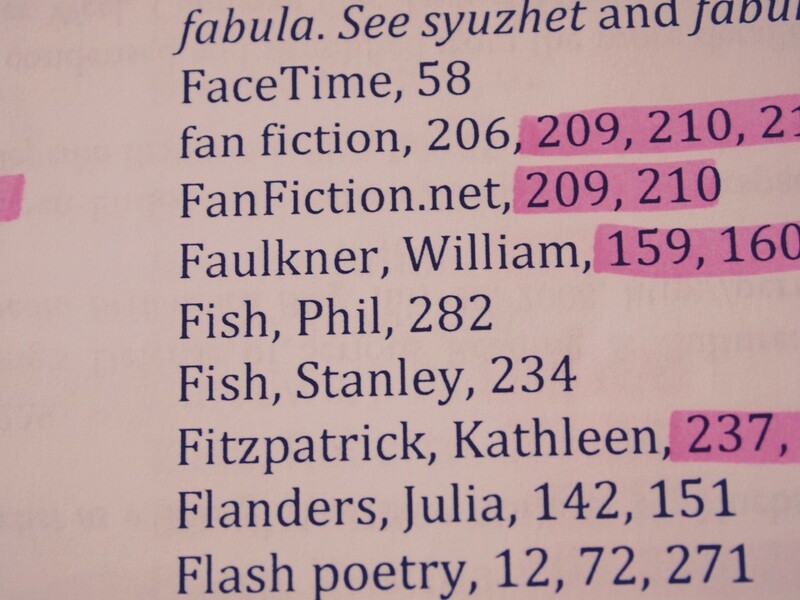 And I have the “other” two Jameses: Henry and E. L.
Looking at the index reminded me of why I enjoyed writing this book so much: it gave me a chance to talk about all kinds of wildly disparate things and to try to find connections between them.